Greetings and salutations, everyone; yes, once again it is I, Mani the regular-sized purebred border collie, filling in for the guy I live with, and here to bring you up to date on all our activities. You may remember me from such posts as “Another Fantastic Week”, among so many, many others. 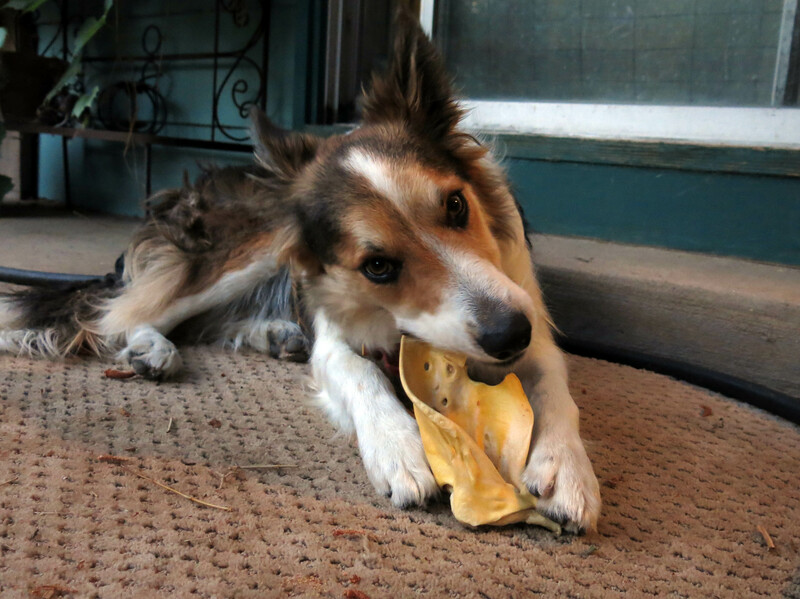 Here I am in a characteristic pose, enjoying a dried cow ear. Dried cow ears are really quite excellent, if you didn’t know. I got this to chew on because I just came back from vacation. Yes, you read that correctly; I’ve been on vacation. It started last Thursday, when it looked like I was just going to Thursday Day Care, but then instead of being picked up by the guy I live with, it turned out that I was on vacation. It was okay. They have swimming there, and I know everybody. I’d never been on vacation before and the guy I live with was super-nervous about it, though he didn’t tell me that until I got back this afternoon. 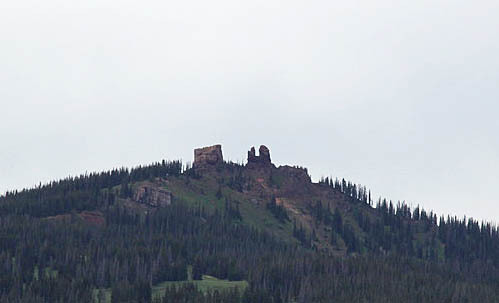 The guy I live with and his friend went to Steamboat Springs for the North American Rock Garden Society annual meeting. I kind of wondered why I didn’t get to go along, but I guess there was something called hiking, which according to the guy I live with involved walking uphill for miles with no relief and no end in sight, and then a bunch of walking downhill. Except for the first time when they went down in something called a gondola. The guy I live with said he was resigned to descending “thousands of feet” in a gondola. About halfway down the gondola stopped, and swayed in the breeze, a bit. He didn’t take any pictures of that. This is what the beginning of a hike looks like. It goes on like this for a very long way; up and up and up. Those are penstemons flowering on the right. Really, though, this is looking back from where they came. 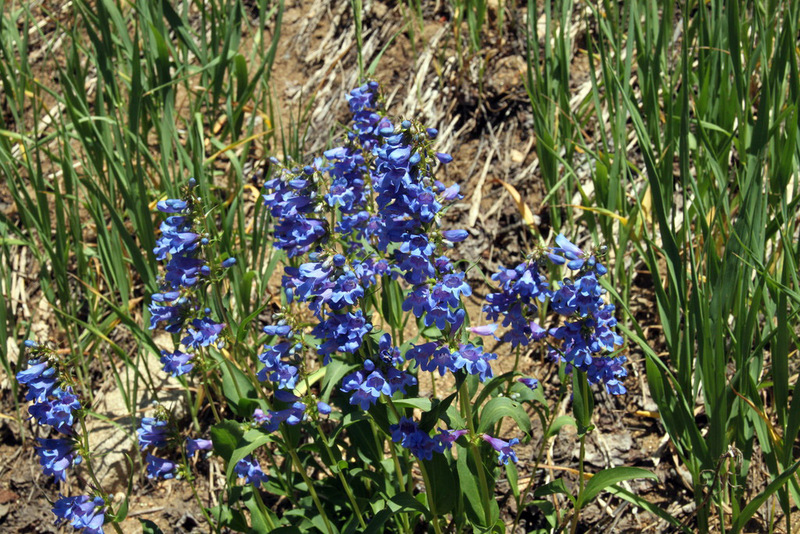 He says this is probably Penstemon strictus, though the leaves are kind of wide for that species. 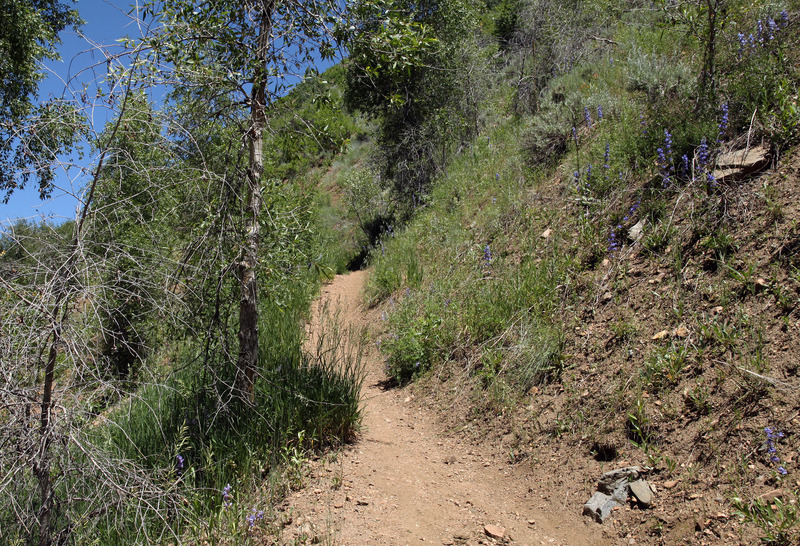 This is what the trail looked like on part of the hike. 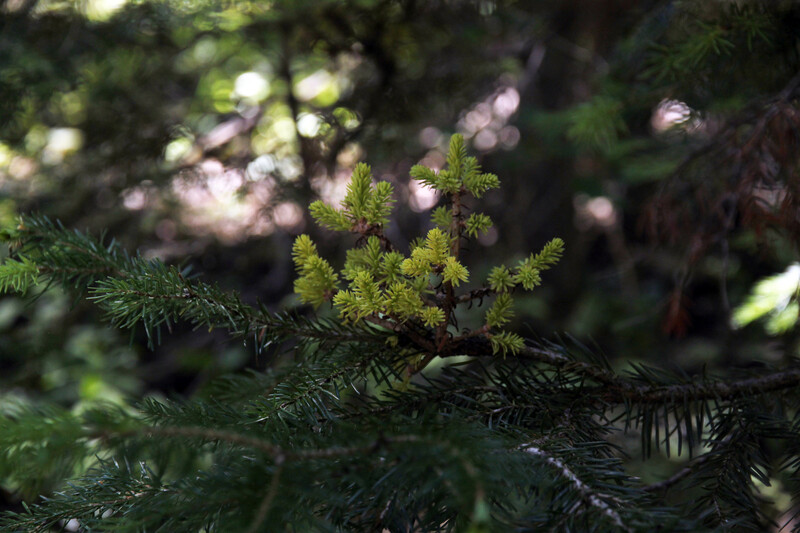 There were weird witches’ brooms on some of the conifers, in the dark part of the woods they hiked through. 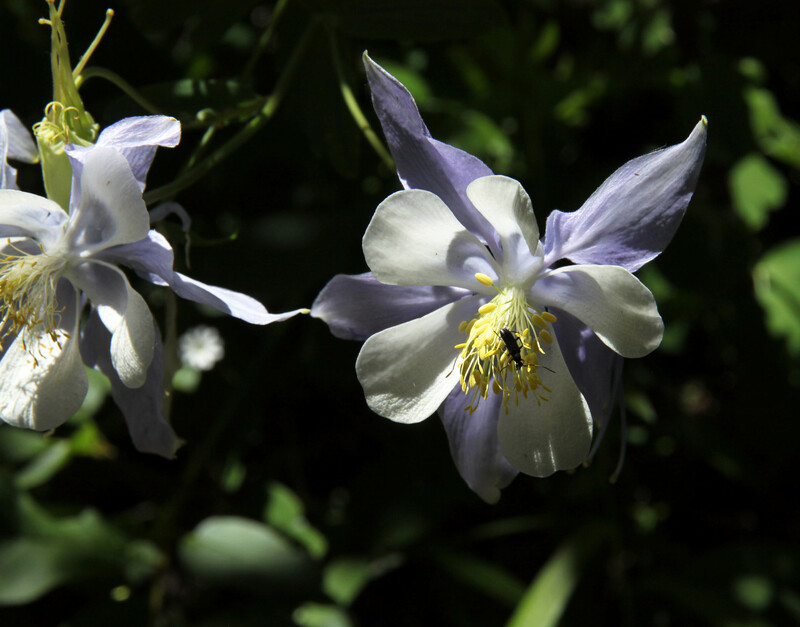 A bug on the Colorado columbine, Aquilegia coerulea. 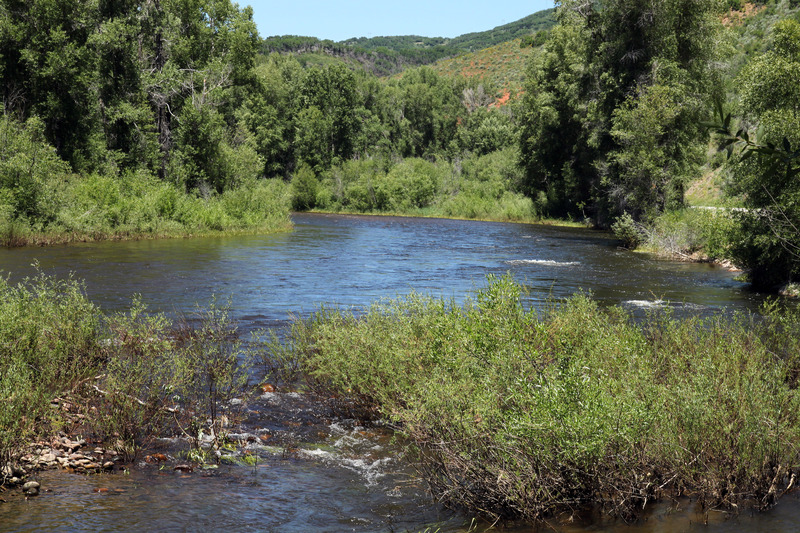 This is the Elk River. As you know, I like water a lot, and wouldn’t’ve minded swimming in the river. The guy I live with says that’s one reason I didn’t go. 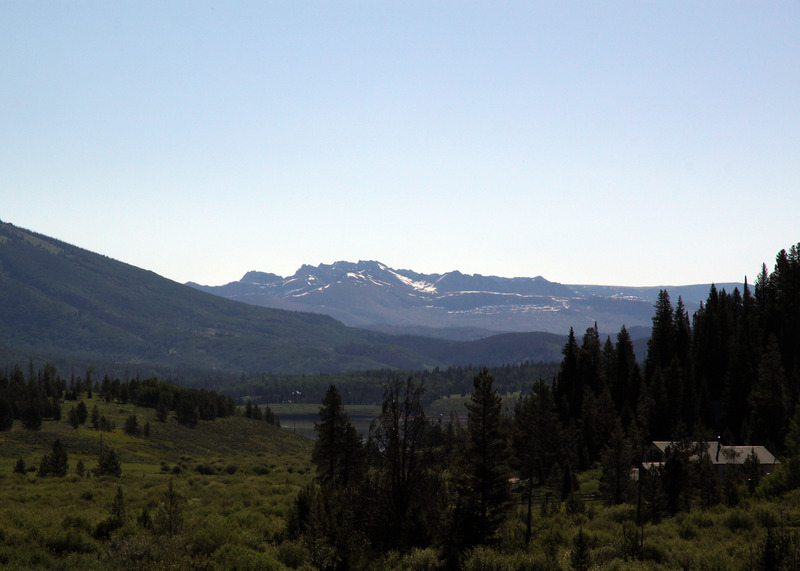 This is the Mount Zirkel wilderness area; this picture was taken today. The guy I live with says this is one of the wettest places in Colorado. The Wyoming border isn’t too far away, off to the left (north). 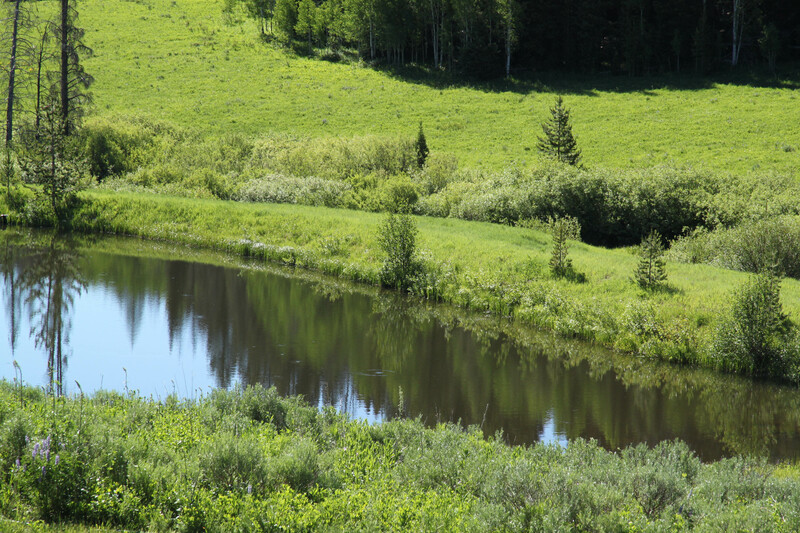 A pond in the mountains. I could have gone swimming in that, for sure. I guess they saw other stuff, but these are the pictures that the guy I live with said to post. I’m not really sure who was more exhausted by their vacation, but it might have been me. I’m glad to be home and to be able to lie out on the cool patio at night. Lila doesn’t know it either but she’s going on a short 3 day vacation soon, I wish she shared your positive outlook on the experience. The guy I live with didn’t say anything about my vacation until I was back from it, though it does explain why he was all teary and extra-nice to me when I went for Thursday Day Care. Actually, I went to my regular Wednesday Day Care, and when I came back, the guy I live with left, and was gone for a while in the evening (to a meeting at DBG, he said). They have something called “air conditioning” at Day Care and I think we need to talk about that some more. Help is on the way. Several times you’ve mention how uncomfortable you get when a thunderstorm rolls by. Now this is not a bad thing, it has an evolutionary advantage. Some people eager to show they are not frightened by thunder and lightning, don’t seek shelter (you don’t have hide under a bed) and stay outside. Occasionally people like this are struck by lighting and are removed from the gene pool. Caution is a good thing. I enjoy your blog posts. They are both interesting and informative and it’s always a good day when a new one arrives. I’m not as afraid of thunder as were the other purebred border collies who lived here. Yet, anyway. Too bad you couldn’t go. It looks really beautiful. There is a big fire about 10 or so miles north of the Mt. Zirkel area near the Wyoming border so maybe not quite as wet up there. Looks like you are going to be nice and cool soon, Mani but uh oh, thunderstorms. 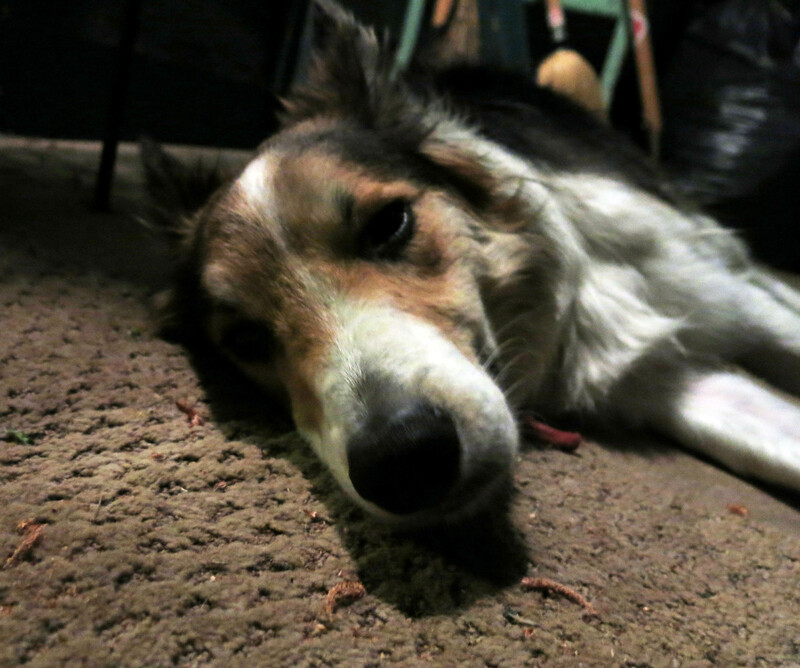 Did you spend the night with any of your day care pals, or did you all go off to your separate kennels? Separate I suppose, to be safe. We were separate, but very safe. I had to tell that to the guy I live with who knows how many times. There was a big forest fire to the north of where they were staying and hiking and listening to talks and visiting gardens, and it made the air all smoky and hazy. “Uh oh, thunderstorms” is right. There was a big one here today, that missed us completely (whew); the weather service said “half-dollar-sized hail“. Definitely uh-oh. So you had the spa experience, Mani, swimming pool and air conditioning and separate accommodations. When our dogs stay at the Golden Paw Spa over a certain number of days they have to be “groomed” before they are released to us. They are familiar with a hair dryer and suffer it well; one of them even preens. I can’t see you preening, Mani, you’re not a preening sort of dog. You’re more a romp-in-the-water type. Hiking in uphill country in midday heat with the air all smoky would not be excellent for me, rather more in the ordeal category. However, the flower photos are beautiful and that wildflower part of Colorado is especially pretty. 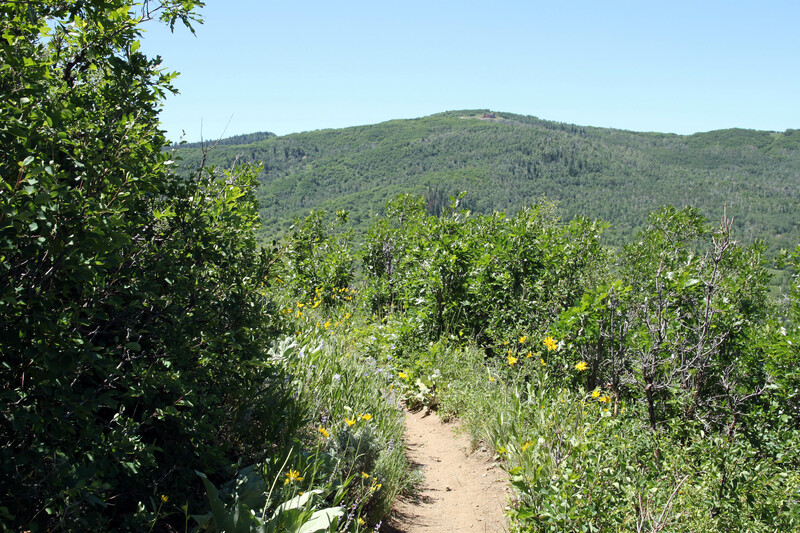 In such surroundings, perhaps this hiking thing is not so bad. Always good to get away for a bit to appreciate home all the more when you’re back and chewing on a cow’s ear. You seem none the worse for spa wear, and I bet the guy you live with enjoyed himself too.